24/4/12 - Acquisitions - New York, Metropolitan Museum of Art - The Metropolitan Museum recently acquired two 17th and 19th century paintings, their only point in common being that they are both from Italy. 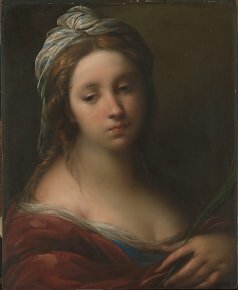 The first is a Woman Martyr by the Lombard painter, Carlo Francesco Nuvolone (ill. 1), bequeathed to the museum. It is similar to other figures painted by the artist, notably a queen posing for a painter, no doubt a scene from the life of Esther, residing at the Musée des Augustins in Toulouse, as well as a Woman held at the Museo Cerralbo in Madrid. Nuvolone probably used the same model, set down first in a drawing, for his three paintings. We have often mentioned here on our French site the work of Christoffer Wilhelm Eckersberg who was a leading figure of the Danish Golden Age. 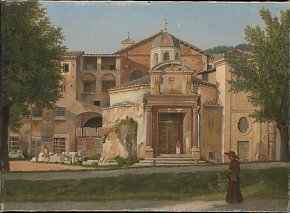 This student of David lived in Rome from 1813 to 1816, during which he produced many oil studies, often painted from life, offering an original viewpoint or focus of the city’s important monuments. There is for instance a luminous perspective behind the Coliseum at the National Gallery in Denmark, the requisite Forum at the National Gallery in London and the Via Sacra at the Carlsberg Glyptotek in Copenhaguen. The Metropolitan purchased another section of the Via Sacra, a view of the Church of Saints Cosmas and Damian, sold at auction on 28 November 2011 in Copenhaguen at Bruun Rasmussen’s (ill. 2). The canvas illustrates notably the temple of Romulus dating from the 4th century which was integrated into the church. Until now, the Met owned only drawings by the artist but already holds works by other Danish painters from this Golden Age, such as Kobke and Fritz Petzholdt.